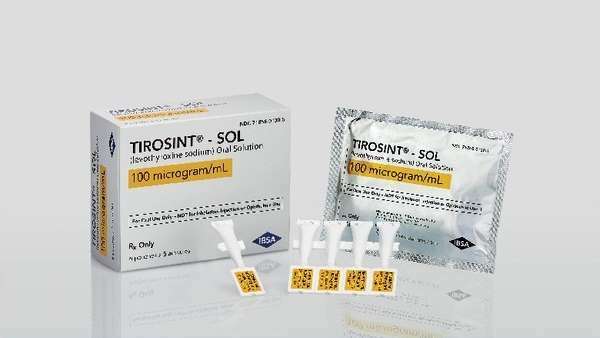 Tirosint-SOL (levothyroxine sodium oral solution) has been made available by IBSA Pharma for the treatment of hypothyroidism and pituitary thyrotropin suppression. It is the first liquid formulation of levothyroxine approved by the Food and Drug Administration (FDA). Tirosint-SOL is packaged in monodose ampules in 12 different strengths: 13mcg/mL, 25mcg/mL, 50mcg/mL, 75mcg/mL, 88mcg/mL, 100mcg/mL, 112mcg/mL, 125mcg/mL, 137mcg/mL, 150mcg/mL, 175mcg/mL, and 200mcg/mL. The product is free of dyes, gluten, lactose, alcohol, sugar and other excipients that may interfere with absorption; it can be administered in water or directly into the mouth. “This easy-to-swallow option will provide a useful new option for many patients who may benefit from a liquid rather than an oral solid version of this proven therapy,” said Dr Murray Ducharme, Professeur Associé, Faculté de Pharmacie at the University of Montreal. Weekly vs. Daily Levothyroxine for Hypothyroidism: What’s More Effective? Tirosint-SOL is supplied in 1mL unit-dose ampules; each ampule bears a colored label with the dosage strength and the product name. The product is available now through the Tirosint Direct Program and will be available in pharmacies starting March 1st. For more information visit tirosintsol.com.